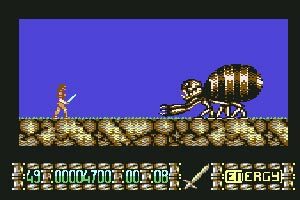 Fears of darkness was the result of a budding programmer at the age of 18 wishing to produce a "Turrican-esq" game. 64er magazine had released Manfred Trenz’s Katakis Development System which was to be the inspiration for Falk to get programming Fears of Darkness. Coding was carried out and also the graphic work too, right up until 1994. Falk sent the preview version to a guy in Fulda who mentioned that he would like to help him release the game when its finished. It seems that he just crack released it instead. Still – Falk continued with the game and added various features (Some of which can be read about in "Creator Speaks"). The game music just contained some quickly ripped music from Last Ninja 2. However, due to the C64 dying out and other various bits and pieces, Falk decided to call time on the project and it was cancelled in late 1994. A shame, because the preview is very promising and this would have been a very well recieved game had it been finished and released. I started painting some level graphic and sprites and begun coding... until 1994. Maybe some floppies still work. If so I can send you some shots of this material. I ripped the music from "Last Ninja 2" and relocated it from $4000 to $1000 by changing some $4x bytes that seemed to look like pointers. Can´t believe that this have worked. ;-) In late 1994 I dicided to cancel this project..."